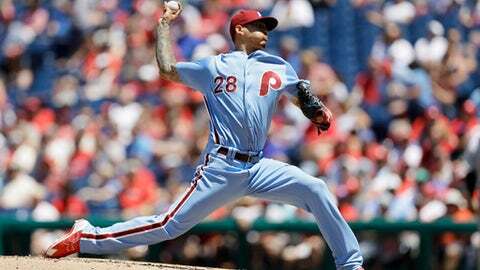 PHILADELPHIA (AP) Vince Velasquez took a no-hitter two outs into the seventh inning, Rhys Hoskins and Nick Williams hit solo homers and the Philadelphia Phillies beat the Colorado Rockies 9-3 on Thursday. Giants starter Dereck Rodriguez pitched 6 2-3 innings, allowing two runs. Ty Blach (4-5) also pitched 6 2-3 innings for the Giants without allowing a run. Elieser Hernandez (0-4) took the loss. Khris Davis and Matt Olson homered for the A’s. Both home runs came off Verlander (9-2), who struck out seven, allowed three runs and didn’t walk a batter while earning his fifth consecutive win. PHOENIX (AP) – David Peralta hit a pair of solo homers, Matt Koch pitched six effective innings in a combined four-hitter and Arizona handed New York its 10th loss in 11 games. Amed Rosario pulled the Mets within a run on solo homer off Archie Bradley in the eighth inning. But Peralta, who homered off Jason Vargas (2-5) in the fourth inning, hit his 14th of the season off Jacob Rhame in the bottom half. Jake Lamb also homered in the eighth to help Arizona win for the sixth time in seven games. Paul Goldschmidt also hit a solo homer for the NL West-leading Diamondbacks. Brian Boxberger worked a perfect ninth for his 15th save. The Mets failed to score more than three runs for the 10th straight game.